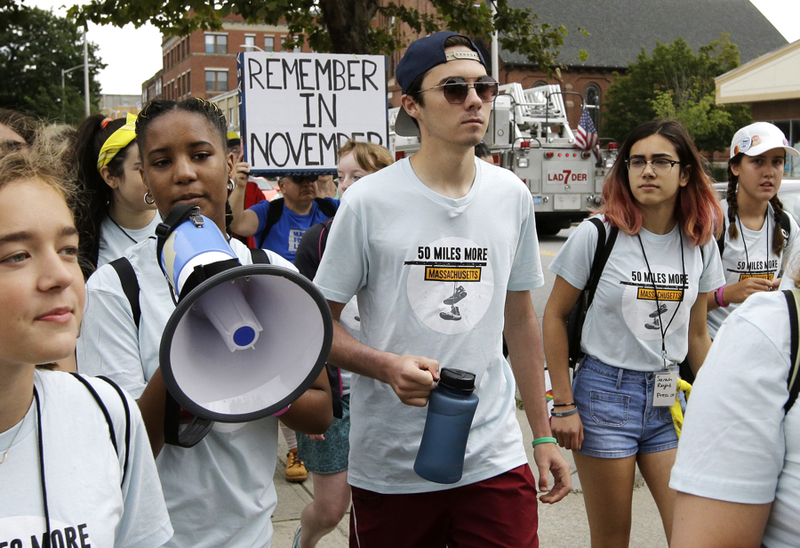 Update: A few dozen students and some adults set off from Worcester Thursday morning, joined by Parkland shooting survivor and gun reform activist David Hogg. They plan to arrive in Springfield on Sunday to rally outside the Massachusetts gun manufacturer’s headquarters. Earlier this year, when Massachusetts teenagers erupted into protest marches, walkouts, and rallies after the horrific school shooting in Parkland, Florida, the common refrain you heard from them was that their calls for gun reform were more than just a moment; they were a movement. Now, several months later and after the fervor that followed the mass shooting in Florida has begun to die down, local teenagers now say they will remind everyone of the dangers that persist in a country where widespread, under-regulated, high-powered weapons are readily available. On Thursday, they plan to begin a four-day trek from Worcester to the Smith & Wesson facility in Springfield in a 50 Miles More march, one of several planned around the country. Joined by Parkland shooting survivor and gun reform activist David Hogg, marchers plan to meet at Worcester City Hall at 9:30 a.m., then head out for the journey to Springfield. It’s not clear how many will be taking part. As of Tuesday afternoon, 64 said on a Facebook event page they would attend. Smith & Wesson came under fire from the office of Attorney General Maura Healey, who in 2016 ordered the gun manufacturer to stop selling “copycat” firearms she said were designed to comply with the letter, but not the spirit, of a statewide ban on assault-style weapons. This week’s protest is a collaboration with the local nonprofit Stop Handgun Violence and March for Our Lives: Boston, as well as with 50 Miles More, a national organization founded in the wake of the massive protests in March as a way of keeping the issue in the spotlight. The national group has called for a ban on “military-style weapons,” bump stocks, and people under 21, along with mandatory background checks and a four-day waiting period for gall gun sales.